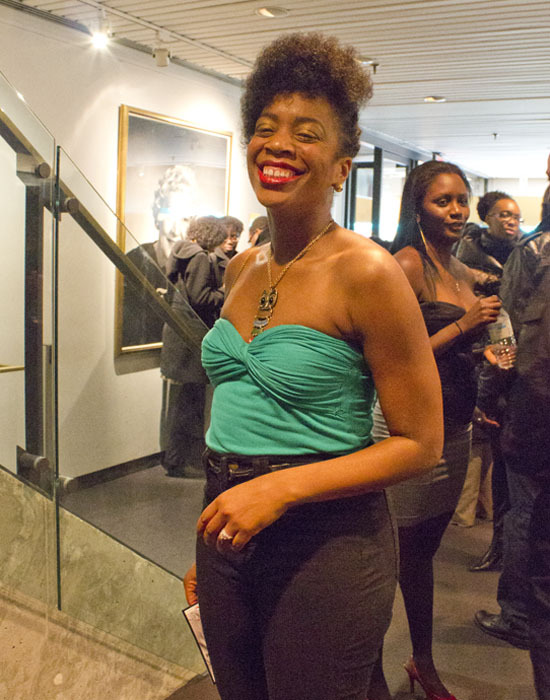 When Sisters Speak Poetry Concert series held their 12th annual show Saturday night inside the St. Lawrence Centre for the Performing Arts in downtown Toronto. The show which is the brain child of poet and entrepreneur Dwayne Morgan features poets from as far away as Atlanta. Morgan who has created various poetry events throughout the city uses When Sisters Speak to showcase six eloquently versatile female poets who present raw perspectives and intimate experiences with ease to a mesmerised audience that claps, snaps, cheers and gasps along with every word. This year’s show was bitter sweet for poet Devon “The Split” Jones who opened the show. Jones who has a long successful poetry career chose the When Sisters Speak concert to be the stage on which she retires. Jones wants to pursue other avenues of writing. “I have three novels in my head, I just need to write them” Jones confessed the night before the show in an interview at a local Portuguese bakery. “I have done everything I want to do with Poetry” said Jones who has traveled all the way to London to perform. Jones has left poetry in good hands though, and the rest of the show was evidence of that. 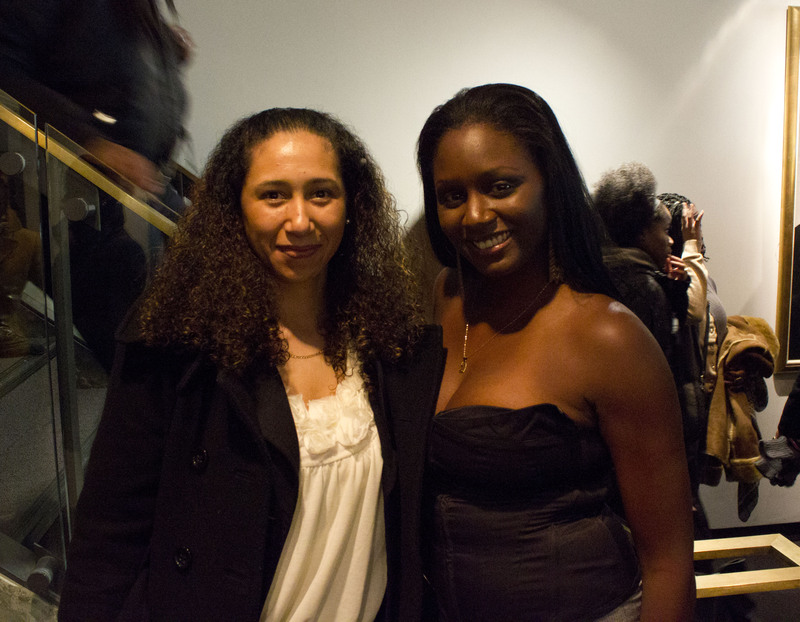 The second poet Dasha Kelly came all the way from Milwaukee to share her art and was well received by the Toronto crowd. Her poem “This is for all the little girls that were told they talk too much” was a an instant crowd pleaser, as members from the audience yelled out in affirming cheers as they related to the little girl in Kelly’s poem. Performing third was the young and exuberant Keisha Monique a Toronto resident by location but a world traveller at heart, she performed an opus to her mother who was seated in the same row as me. The Poem entitled “My Mama is an O.G” paid homage to her mother’s struggle for freedom and rights a memorable verse “My mama so gangster, she took superman’s cape and made it into a head wrap” caused the audience to break into uncontrollable applause and cheers. 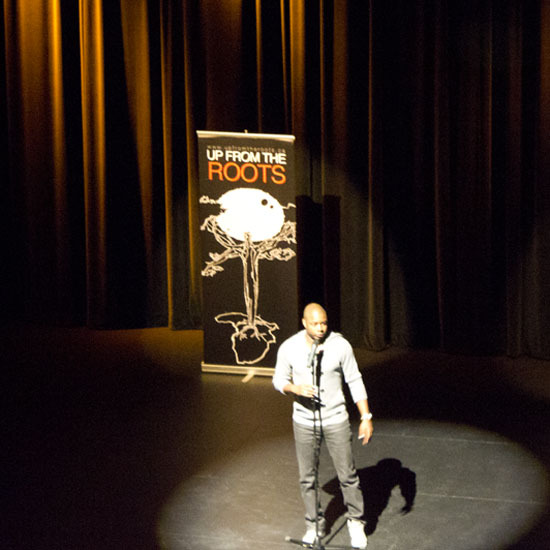 After a brief intermission the show continued with poet Truth Is… a veteran to the Toronto spoken word scene. 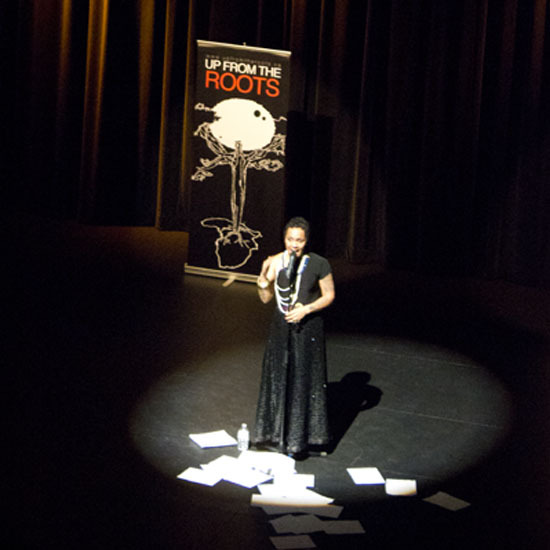 Truth’s poems hit the crowd with an intensity that was tangible. Her final poem was inspired by her father who sadly passed the day after Truth married her partner. “I think they call that an emotional rollercoaster” said Truth with painful emotion in her voice. Next up was Dr. Naila Keleta-Mae who gained the audience favour through song. She went on to talk of her young daughter and the roles of girls in society. “I used to drop my daughter off at day care and say be a ‘good girl’, now when I drop her off I say ‘know your human rights’.” Concert goers responded immediately with a loud roar of approval. The concert concluded with Atlanta based poet Queen Sheba who had made it from the airport to the venue in the nick of time. Thankfully she made it. Sheba interacted with the audience with ease. She grasped a stack of papers she shed with each line like they were pieces of her soul she was leaving bare on the auditorium floor. 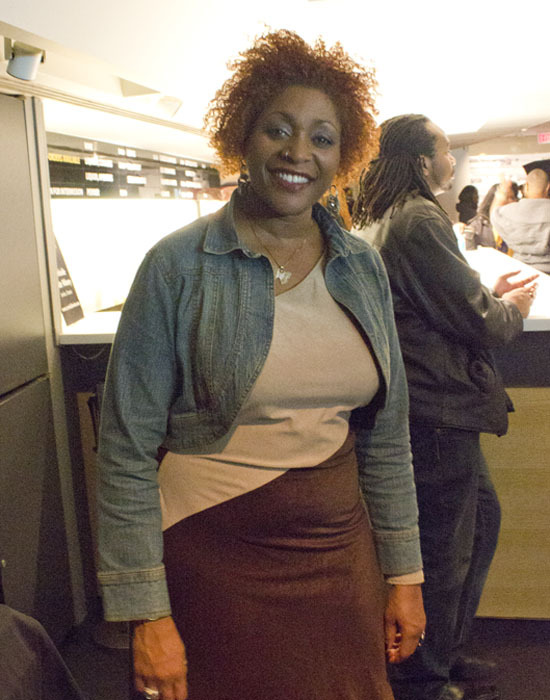 Her poetic style was conversational and inviting and elicited crowd goers to shout out in approval. When Sisters Speak has grown so successful it now tours to Ottawa and will take over the stage inside the University of Ottawa’s alumni auditorium Sunday night. Morgan hopes to take the tour even farther in the future like his long running success When Brothers Speak which performed its 24th anniversary series in Toronto, Ottawa, and Buffalo. When Sisters Speak is a spoken word event like no other, It is a night of unity and friendship and woman’s empowerment that leaves concert goers with an invaluable sense of community, pride and confidence. This was evident on the faces of all the women that filed out into the cold Toronto air with their heads held high and a feeling that anything was possible in their hearts. 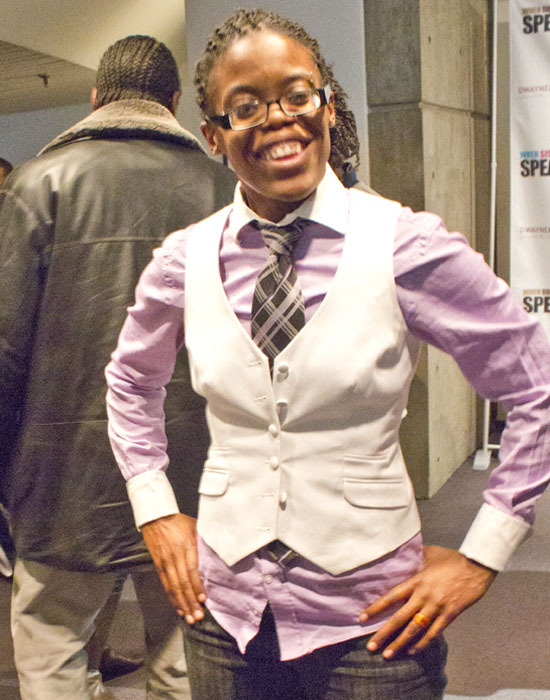 This entry was posted in Arts, Spoken Word, Toronto and tagged Dasha Kelly, Devon "The Split" Jones, Dwayne Morgan, Kiesha Monique, Naila Keleta-Mae, Queen Sheba, Spoken Word, St. Lawrence Centre for the Performing Arts, Toronto, Truth Is..., When Sisters Speak. Bookmark the permalink.